In our couple of blog post related to Back to Basics Series we discussed about Virtual Machine Files (Part1), Standard Switches (Part2), vCenter Server (Part 3),Templates (Part4) vApp (Part 5), Migration (Part 6),Cloning (Part 7), Host Profiles (Part 8), Virtual Volumes AKA VVOL's (Part 9) Fault Tolerance (Part10) and Distributed Switches (Part 11) and we also discussed about the various tasks related to building Home Lab Part1, Part 2, Part 3,Part 4 Part 5. It's been so long i have updated any article related to back to basics series so thought of dedicating this article to understand functionalities of Distributed Resource Scheduler a.k.a DRS. But before we begin and talk about DRS let's think about life without DRS for a minute? Well thinking from an administrator perspective how difficult it would be to keep an eye on resource consumption of our ESXi hosts running in our HA Cluster. Or in another words how difficult it would be to ensure that all my Virtual Machines running in HA cluster are balanced across the available number of ESXi. Certainly life without DRS is hard to imagine as it would require a lot of manual intervention in terms of balancing the Virtual Machines in cluster. Role of VMware vSphere High Availability is only to restart our Virtual Machines but not to load balanced them ! Load balancing requests would be taken care by DRS so let's find out how DRS plays an important role in our VMware vSphere environment. 10 Things You Need to Know about Distributed Resource Scheduler. vSphere DRS can be created or can be enabled on our existing vSphere HA and VSAN Clusters. vSphere DRS Works best when our Virtual Machines meets the requirements of VMware vSphere vMotion including shared storage, and vMotion Network. 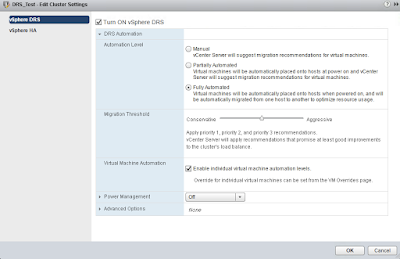 While creating the vSphere DRS cluster we can select the automation level which helps us in understanding whether the vSphere DRS should generate migration recommendations or automatically place the Virtual Machines on the host. 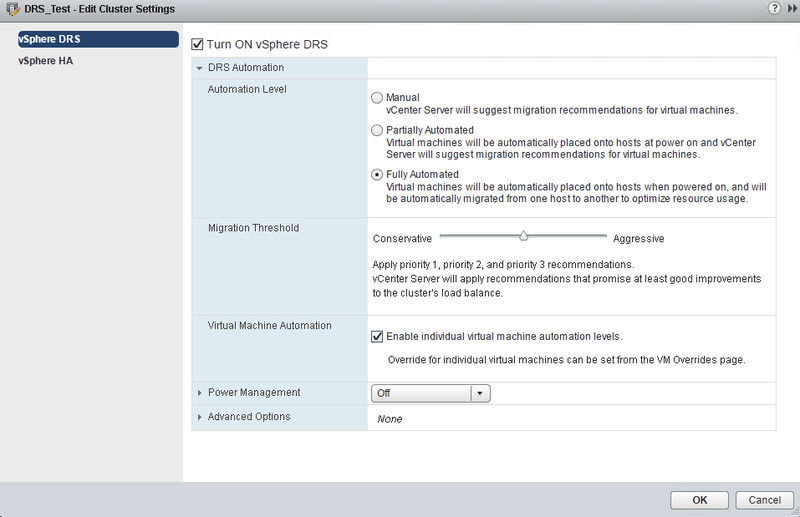 Automation levels includes Manual - When we power on the Virtual Machine vSphere DRS lists recommendations where to place the Virtual Machine.However when we select Partial Automated - The Minute Virtual Machine is powered on vSphere DRS will place it on best suited host and if in case the cluster becomes imbalance vSphere DRS will help us with the recommendations so as we can manually migrate the Virtual Machine. Fully Automated - As the name suggests will place the Virtual Machine on best suited host at the time of Power On and will migrate the Virtual Machine if in case the cluster is imbalanced. Automation levels for individual Virtual Machines can be selected if in case we wish to override the automation level set on the entire DRS cluster. Another important option available in DRS settings is migration threshold provided with various levels (Level 1 Conservative, Level 2 (Applying Priority 1 and Priority 2 Recommendations), Level 3 Default (Applying P1,P2 and P3 Recommendations) , Level 4 - (Applying P1,P2,P3 andP4 Recommendations) and Level 5 Aggressive (Applying all the recommendations) ). In vSphere DRS cluster we can make use of Affinity (Keep Virtual Machines Together) and Anti Affinity rules (Keep Virtual Machines Separate). We can also make use of DRS Groups which could be a group of virtual machines or group of hosts assisting us in defining Virtual Machine to Hosts affinity rules. Virtual Machines to host affinity rules majorly includes three important components (Virtual Machine DRS Group, Host DRS Group, and specification including whether the rule is a preferential should or is a required rule must ). Distributed Power Management is another feature provided by vSphere DRS which uses Wake-on-LAN, IPMI, or iLO to power on hosts and is either off (Wherein vCenter Server will not provide any power management recommendations) or works in Manual mode (Where vCenter Server will recommend evacuating the host virtual machine) and Automatic mode ( Where vCenter Server will automatically execute any power management related recommendations).